VMware releases the next stage of its vCloud Automation Center software and adds abilities to automatically and quickly serve a multitude of users and applications, without wasting resources. With vCloud Automation Center version 6.0, VMware continues to enhance their cloud automation management capabilities. VMware vCloud Automation the delivery of personalized application and infrastructure services we make that a reality. 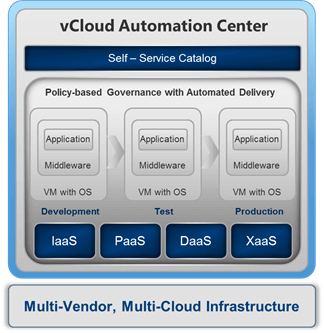 vCloud Automation Center offers a single self-service catalog. From this, users request and manage a wide range of multi-vendor, multi-cloud applications, infrastructure, and custom services. vCloud Automation Center comes complete with policy-based governance. This ensures that users receive the right size resources for the task that needs to be performed. Application release automation ensures that both provisioning and ongoing updates are extremely efficient. It also helps smooth the way for ongoing lifecycle management through the application development and delivery process. In addition, vCloud Automation Center’s flexible implementation approach allows you to deploy new IT services while leveraging existing investments by mapping into your current infrastructure, processes and environments. Empower users to request and manage a variety of IT services that seamlessly span multi-vendor, multi-cloud platforms. Single solution for application release automation that supports various DevOps automation tools. Wizard-driven service designer that allows administrators to define service request forms, configure governance policies and automate the delivery workflow of custom IT services. These services can be published in the vCloud Automation Center catalog along with other application and infrastructure services. New in this release, vCloud Automation Center can dynamically configure and tear down NSX logical services as needed to deliver a secure and scalable application infrastructure on demand. Integration with VMware IT Business Management Standard Edition automatically populates vCloud automation Center cost profiles from an extensive reference database of Infrastructure cost information. Administrators can then compare the cost of their private cloud services to public cloud offerings.